All kids love signs, especially signs with their name and favorite saying on it. 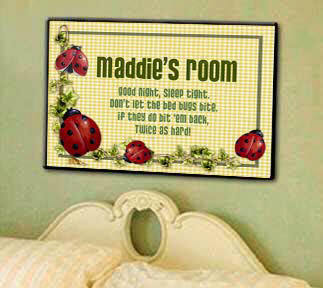 Over the bed, or on a door, these wonderful personalized signs let a child know that their space is special. All of the text can be changed! What is shown below is only an example and shows the text style and color for each sign. ONLY the text you ask for will be put on them. These signs are a generous 12"x18" in diameter and made of 3/4" thick wood with a black routered edge. They come ready to hang.